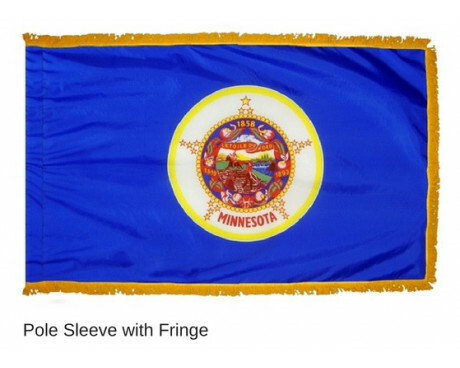 Minnesota state flags have been in use for more than a century, but they have changed significantly over the years. 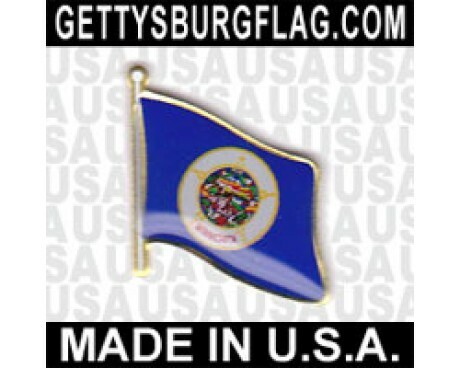 They have always featured the state seal of Minnesota, but the details of that seal and the rest of the flag have changed several times since the flag first came into use. Minnesota state flags have a field of medium blue and display the seal of Minnesota in their center. The seal is placed on top of a star in the center of a white disc. The seal displays a farmer plowing his field as a native American rides past on a horse. The seal embodies the importance of both the native people of Minnesota and the American colonists that contributed to the development of the modern state. The scene includes references to the flag geography and the important waterways of Minnesota which were also important in the state's early development. 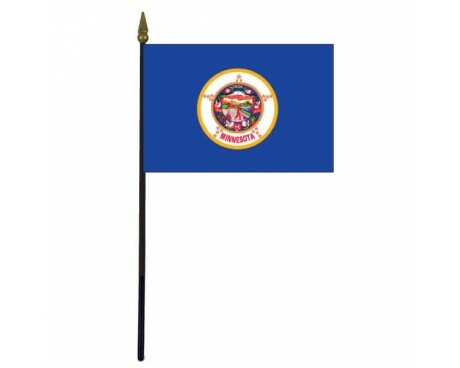 The state flag of Minnesota dates back to 1893, when it was designed by Pauline Gerhardin Fjelde. It had been commissioned by the state government for display at the Chicago World's Fair. Her design was popular at the fair, and the Amelia Hyde Center of Minneapolis soon refined it to create the first official flag of Minnesota. The 1893 design had a solid white field on one side and a light blue field on the other, rather than the darker blue that is used on both sides of the modern flag. The flag also displayed the state's motto and several important dates in the state's history. The flag's design changed in 1957. The field was changed to be solid blue on both sides in order to reduce the cost of producing the flags and to make them more resistant to wind damage. The flag changed once again in 1983 when the state seal's design was altered. 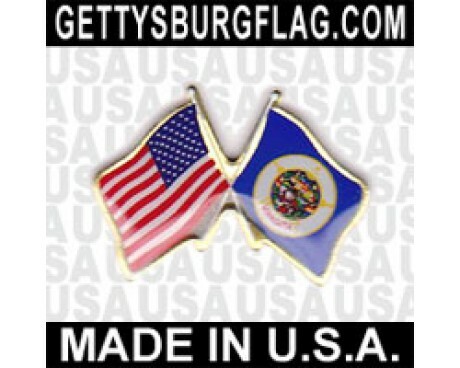 The seal on the flag had to be changed to make it match the new design, and that change produced the current state flag of Minnesota. Many politicians have recently supported efforts to make changes to the flag, so it is likely that the flag will change again in the future. In 1858, Minnesota replaced Maine as being the most northerly state. Another idealized landscape, with the rising sun in the background, as an Indian rides past a farmer cultivating the prairie. The opposite side of the flag was plain blue. 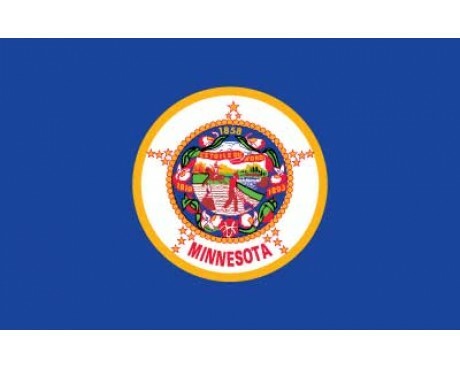 Minnesota adopted this as the state flag in April 1893. There were some slight alterations, such as the seal was reversed, and was surrounded by flowers, and ribbons. The ribbons had the dates of 1893 and 1819. In 1957 the flag changed, which consisted of both sides now blue, with the seal in the center, meaning the seal was turned around again. The moccasin runs around the seal and the 19 stars. The state name appears below the central disc. Today there are movements in favor of changing the flag yet again. Minnesota was claimed by France, and divided between Britain and Spain in 1763. The British part was ceded in 1783, and the Spanish part became American by the Louisiana Purchase. In 1849 it was organized as a territory, and became a state on May 11, 1858.